Image Size: 15 X 29 in. Image Size: 21 X 40 in. Everything you wanted to know about William Shakespeare but were afraid to ask is captured in this whimsical piece of art. Try to find the characters in the plays. There are more than you think! “I’ve had a lifelong love affair with Shakespeare’s works. 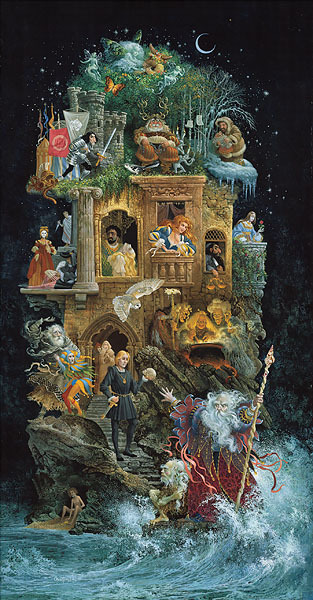 Of all the artists—and certainly of all the playwrights and poets—who have ever lived, Shakespeare comes closest to my ideal” says James C. Christensen. “If I took all my best artistic qualities and exaggerated them to become some sort of creative superhero, I like to think I’d be a lot like Shakespeare. “This painting was commissioned by the Utah Shakespearean Festival. People ask me, ‘Why do you only have some of his plays represented here?’ My answer is always the same: ‘The other plays are on the back of the island, just go around!’ Seriously, a few of the references are tough, so you may need to revisit your Shakespeare to get them all.